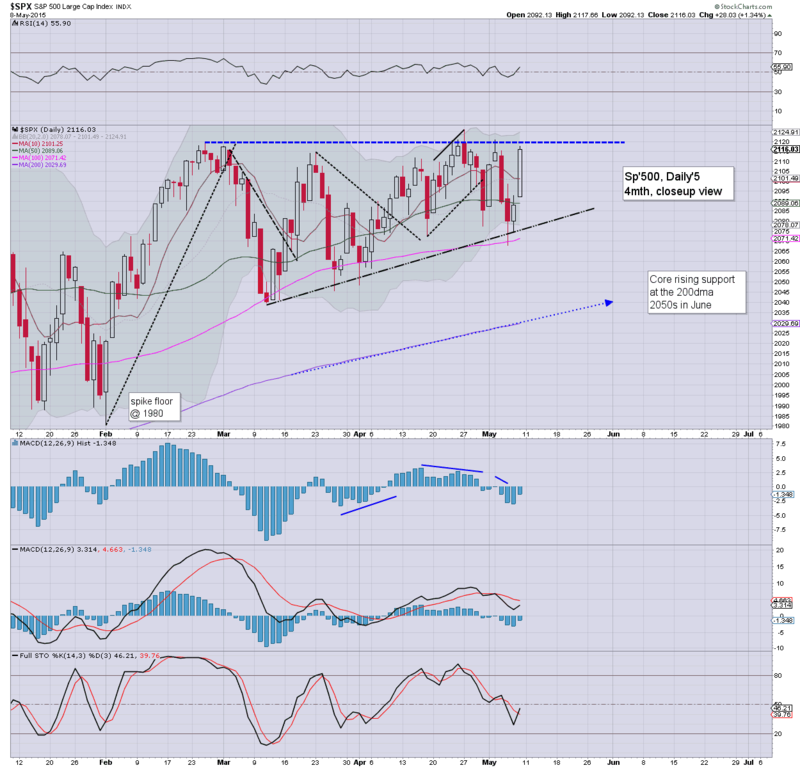 The broader upward trends remain intact for all US equity indexes. 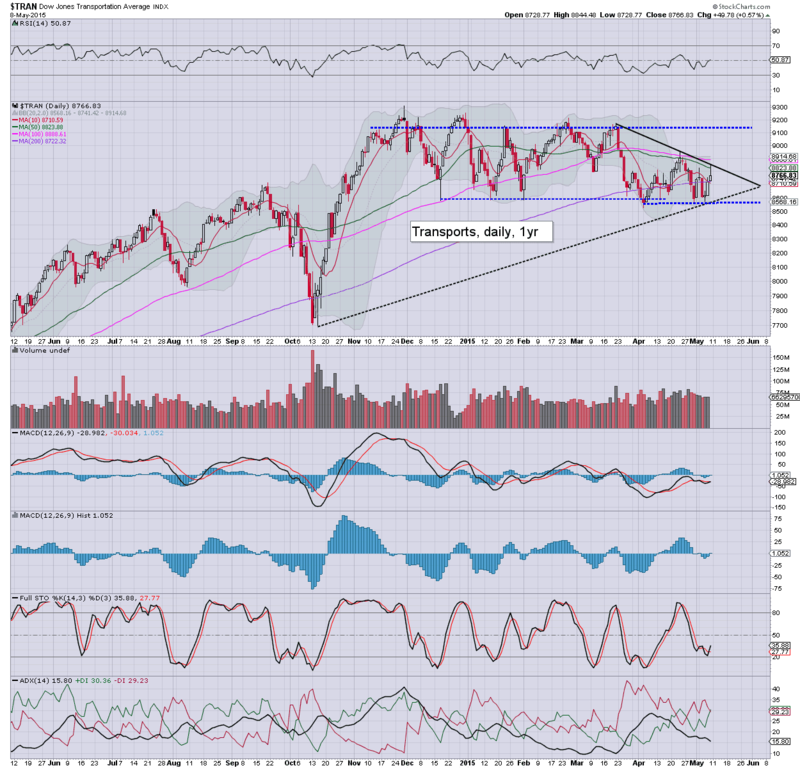 There is notable weak chop in the 'old leader' - Transports, along with the NYSE comp' since last November. 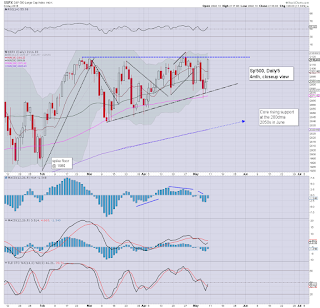 First key support for the equity bears to break is the sp' 2K threshold, but that looks unlikely until at least July. 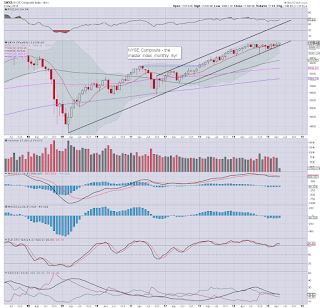 The sp'500 is higher by 1.5% so far this May, and looks set to break new historic highs next week... into the 2130s. 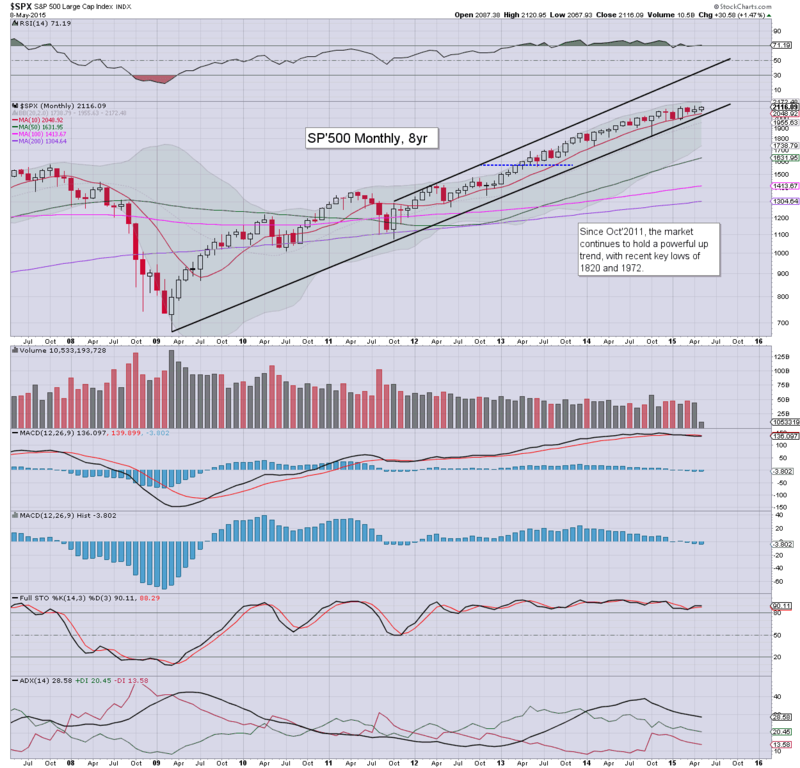 The monthly upper bol' is offering the 2170s, but that looks restrained by the weekly/daily cycles until mid June. 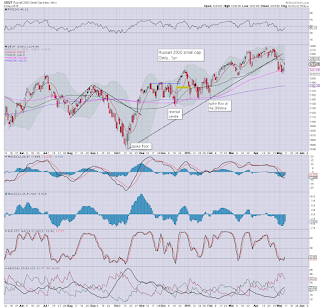 Despite the ongoing broader rise in price, underlying MACD (blue bar histogram) cycle continues to tick lower. Momentum is increasingly swinging in favour of the equity bears, but rather than net price declines.. its currently a case of month over month gains.. but at a much slower rate. 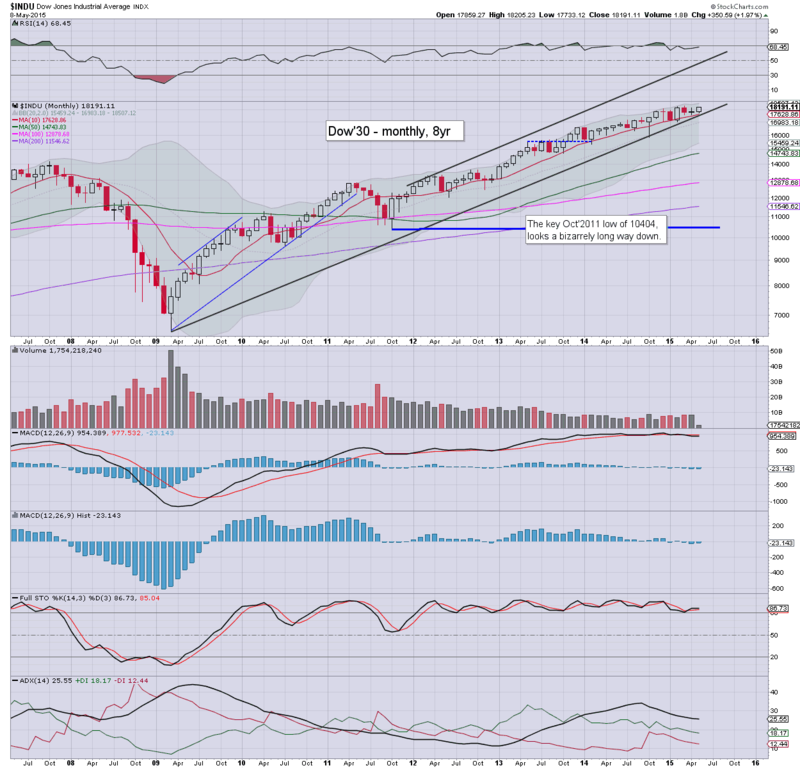 Best guess, upside into mid June.. to the sp'2140/70 zone... and then the market might finally begin a sig' correction into late summer/early Autumn. 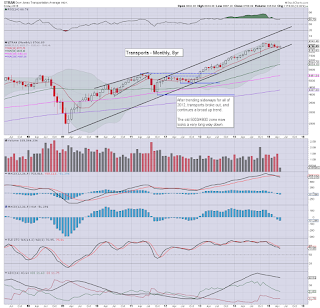 To be clear though, right now - as also based on other indexes, the sp' is NOT expected to sustainably trade under 1900. The broader trend looks set to accelerate once the Fed' finally raise rates, which currently looks viable at the FOMC of Sept' 17th. 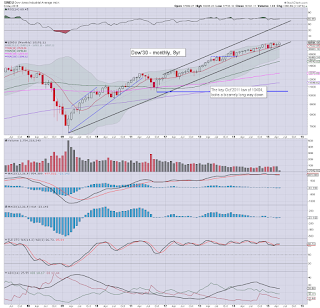 The tech' managed a weekly close above 5K, and looks set to challenge.. and break the March'2000 high of 5132. 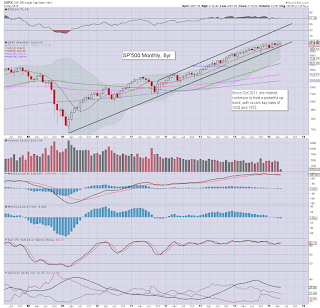 Things really get bullish with a monthly close in the 5200s.. which would be suggestive of further upside to the 5500/5750 zone.. before the first opportunity of a 10% correction. 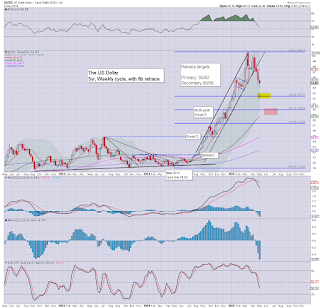 On such a pull back, the giant 5K threshold would then be core support. I remain resigned to broader upside into 2017, and by then.. Nasdaq would likely be somewhere in the 8-10K zone. The mighty Dow is currently higher by 2.0% this month, and looks set for new historic highs in the 18400/600 zone by mid June. 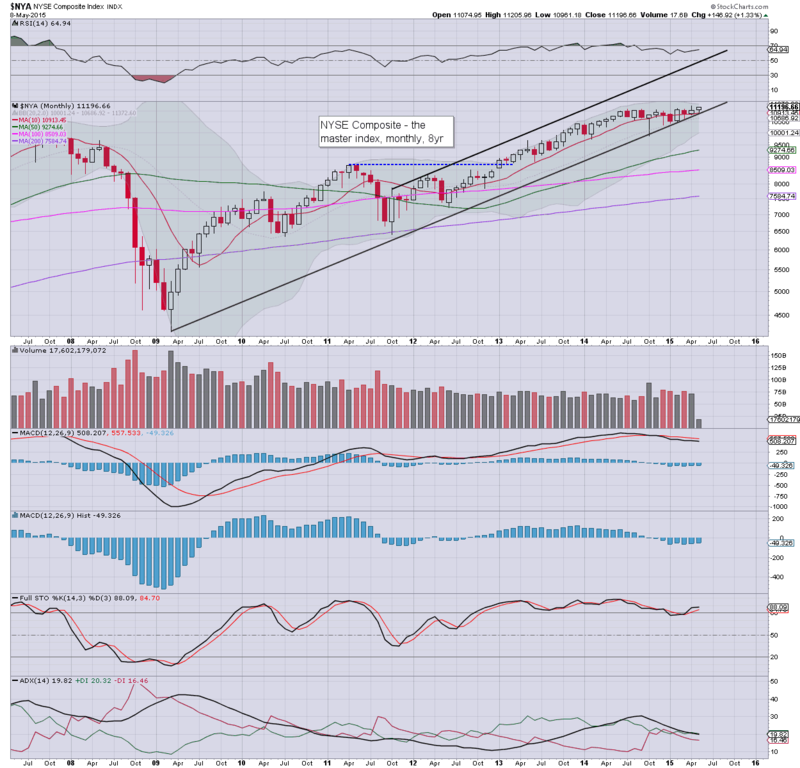 There is high threat the market will get stuck there... before a pull back to 16000/15500. 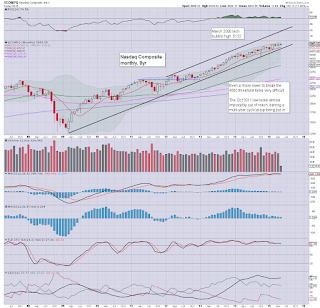 Under no 'reasonable' outlook does it appear possible for the Dow to sustainably trade under 15K this year. 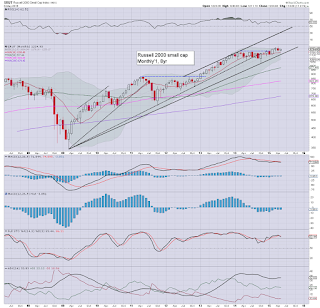 The master index is set for new historic highs in the near term, first target are the 11300s. 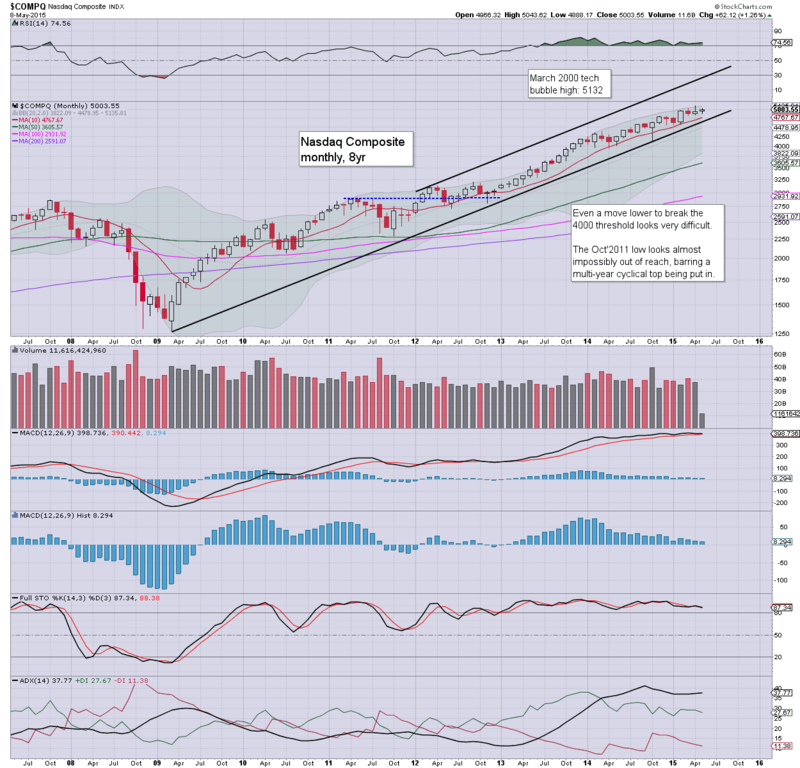 A move into the 11400s would be very bullish, and be indirectly suggestive that the Nasdaq comp' will be able to attain a monthly close in the 5200s.. which itself would be a key signal of continued broad upside into Sept/Oct. The second market leader is currently net higher by 1.2%. 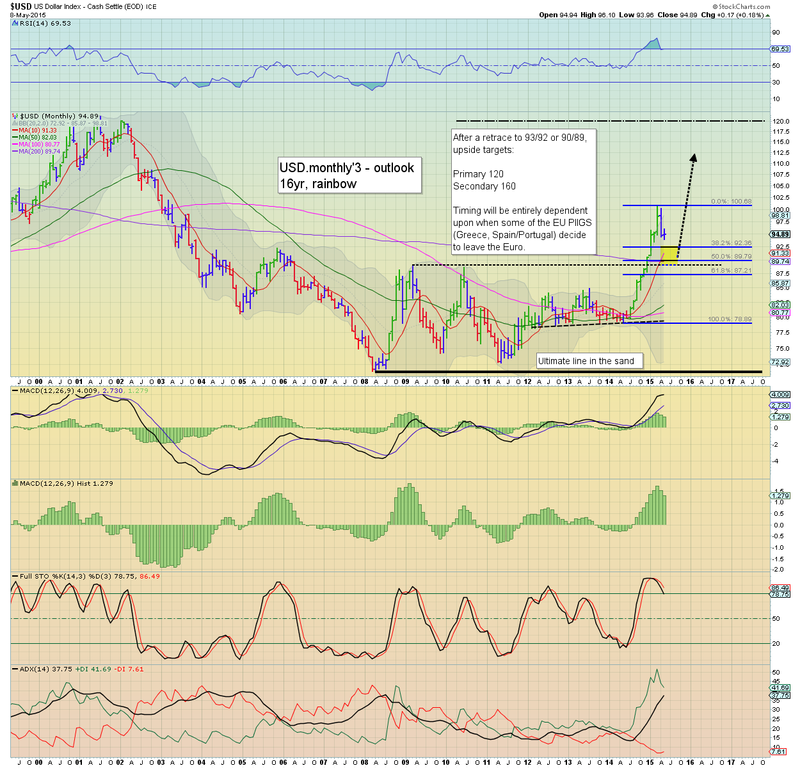 It is notable that the monthly bollinger bands are getting relatively tight. It would seem the next wave lower will not be able to go much lower than 1100/1050. Certainly, the giant 1000 threshold looks out of range, unless a 'grand top' is in.. and I don't believe that is due for another two years. The 'old leader' is higher by 2% this month, but the Transports have been melting lower since the Nov' high of 9310. 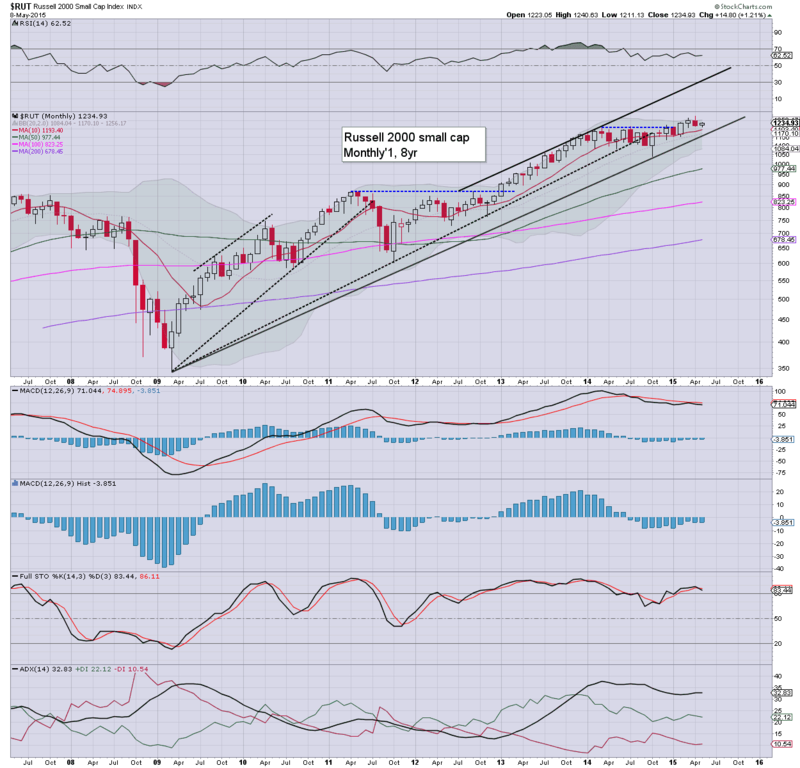 Indeed, hyper-bulls should be seeking a weekly close in the 9300s in June/July, which would offer some hope of 10K, before the next sig' retrace. As things are, with oil prices seemingly headed for at least 65/67 by mid June, this will keep some downward pressure on Transportation stocks, but it probably won't outweigh the positive variables. Without question, there is no justification for any of the few remaining doomer bears to be getting overly excited about some kind of grand top, as ALL broader upward trends remain intact. 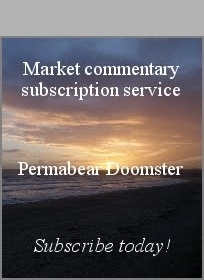 Until the market is sustainably trading under the sp'500 2K threshold, there is simply no reason to be mid-term bearish.. never mind anything more! Another sig'/intermediate correction of 10%... possibly even 15% looks due this summer/autumn, but for now... it looks like that can't begin until at least another set of new highs into mid June. There really isn't much due next week. *the only Fed official on the loose next week is Williams, speaking on the economic outlook next Tuesday lunch time. 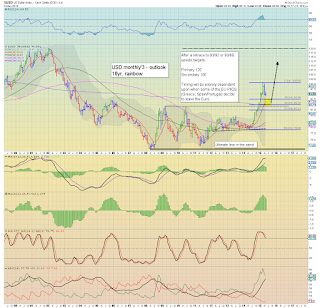 Mr Market will certainly be listening for any chatter on interest rates or indeed... equity valuations! Despite some day to day swings, the USD still closed net lower for the fourth consecutive week, -0.6% @ DXY 94.89 (intra week low 93.96). 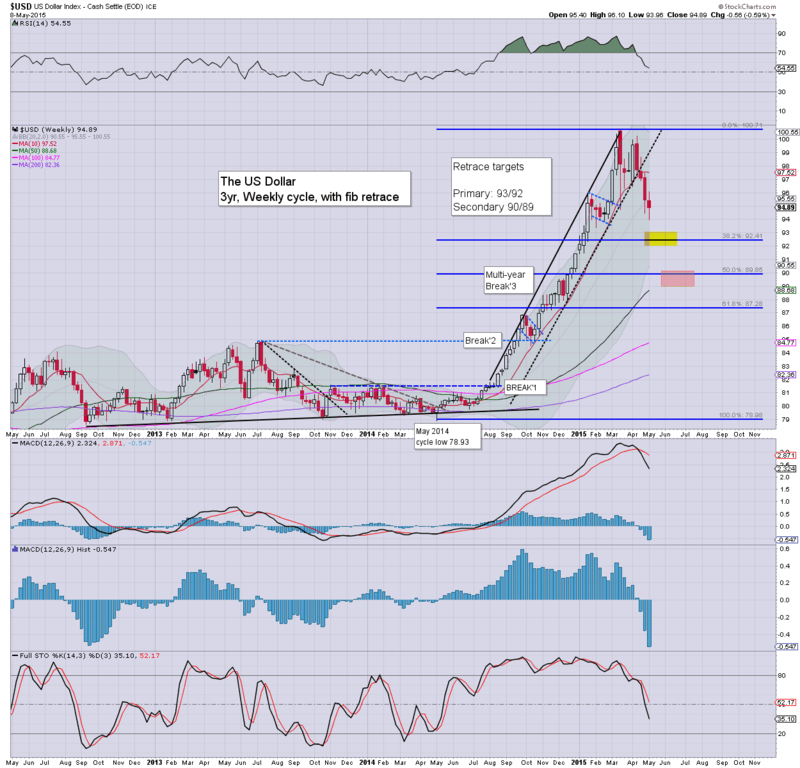 A brief 1-2 week bounce is viable in the immediate term, but it does seem the USD is headed all the way to the secondary target zone of DXY 90/89s.. as early as mid June. .. it has been a long week... 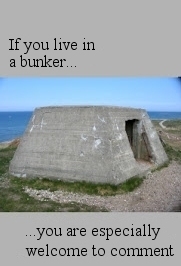 I think I'll leave it at that! 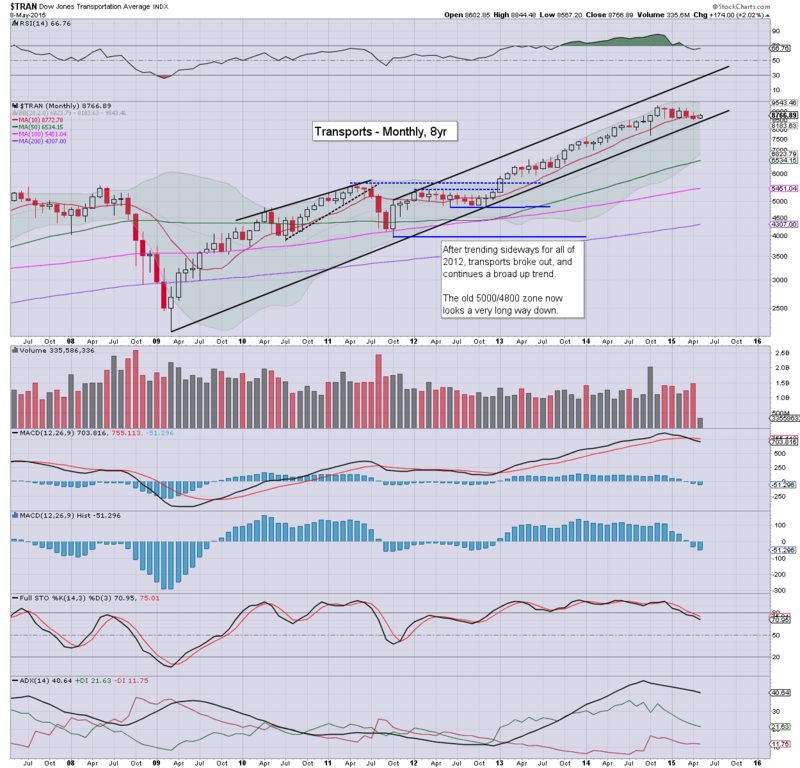 *the two leaders remain notably weak.. but if the Trans can break/hold the 8900s early next week, it does bode for a viable challenge of new historic highs in June. 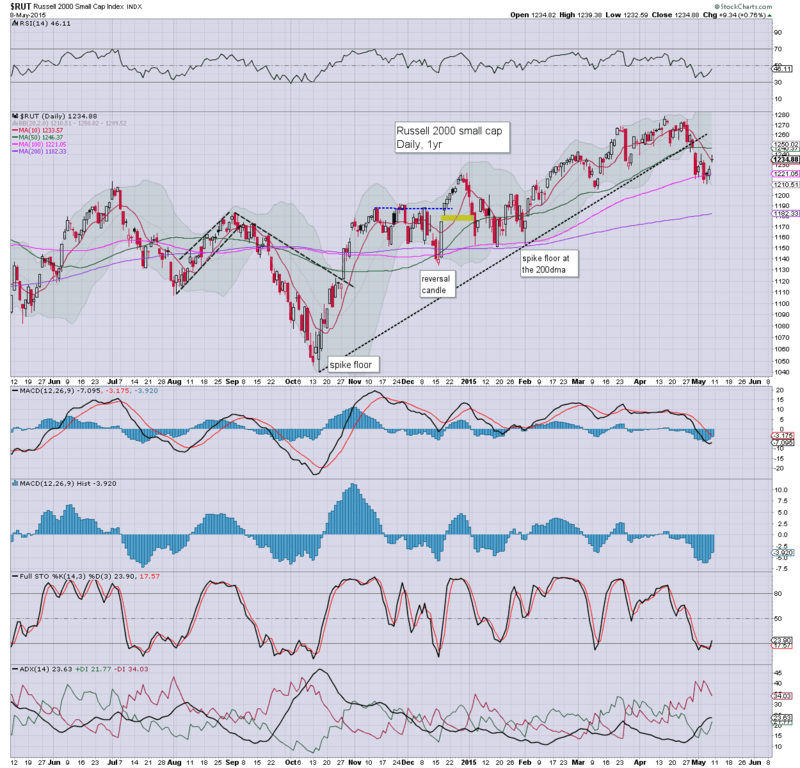 So.. a second day of gains, and the Wed' low of sp'2067 now looks a long way down. Certainly, momentum has now swung strongly back in favour of the equity bulls, and the sp'2130s look very likely next week.